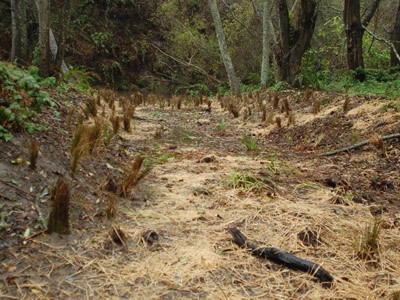 The current Soquel Corridor Restoration Project is an example of how strategic project development funding leads to significant restoration and how initial funding is leveraged in subsequent phases of the project. 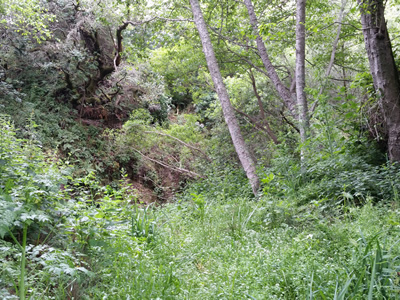 The Soquel Corridor Project is on private land and focused on restoring 2500 feet of riparian corridor, reconnecting portions of the historic floodplain to the main channel, and stabilizing a landslide that is discharging significant amounts of fine sediment into the Creek. 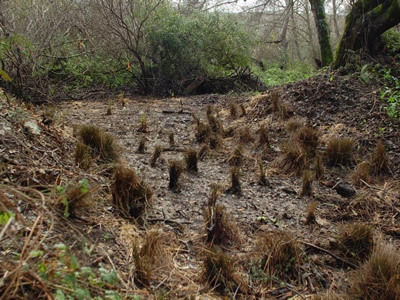 Via IWRP, the State Coastal Conservancy’s investment in design, permitting and technical oversight was matched with implementation funding from the Wildlife Conservation Board, the landowner and local sources. 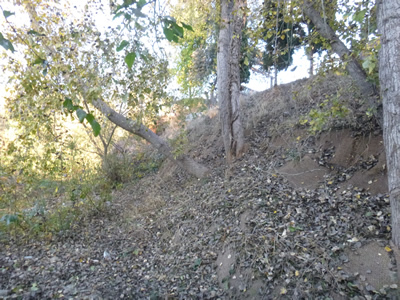 Photo Point 1: Looking downstream, improperly sized rocks along the left bank posed erosion problems and degradation to downstream water quality. Erosion control blankets, willow stakes and other woody native plants were planted to provide streambank stability for expected stream flows. 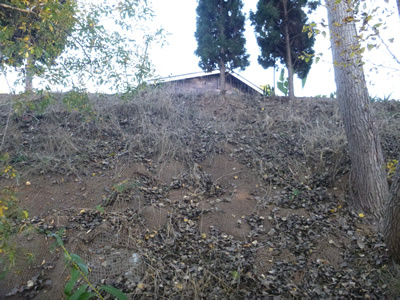 During the late fall 2013 monitoring, little understory vegetation was present but the erosion control blanket was still in place. 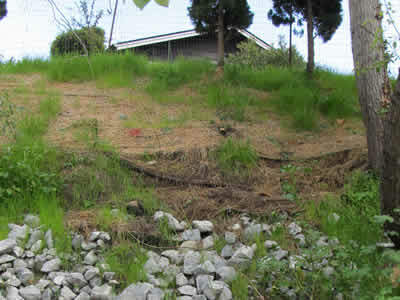 Photo Point 1: Abundant non-native grasses cover the bank but provided some erosion control functions. The erosion control blanket is in place and functioning. While the project has leveraged and impressive 300% from other funding sources, the story behind it involved settling a 5-year dispute between NMFS and the California Department of Fire and Forestry (CalFire). 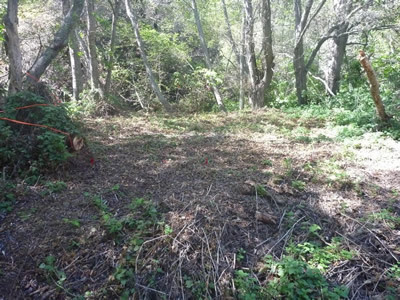 The result was that CalFire used its Soquel Demonstration State Forest to showcase salmon recovery for landowners and illustrated how forestry management and coho recovery can be compatible. Photo Point 2: The rocks on the left bank were too small to withstand expected stream flows. 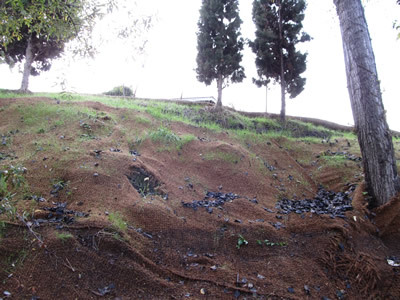 Erosion control blanket continues to prevent erosion, but native vegetation establishment remains low. The rocks were removed and erosion control blankets were laid out over the project site reducing sedimentation and preventing damage to sensitive fish and wildlife habitat downstream. Photo Point 2: The erosion control blanket is still functioning and willow stakes along the toe of the bank are thriving. The purpose of both Phase I and Phase II of Lower Scotts Creek Enhancement were to increase the resilience of the entire hydrologic system to climate variation by addressing both rearing and refuge habitat in high and extremely low flow conditions for coho and steelhead salmon. 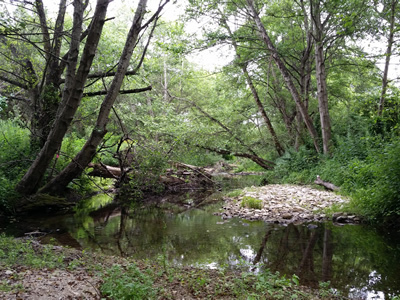 The first phase of projects for Lower Scott Creek enhanced instream and floodplain habitat and to restore natural hydro-geomorphic function. 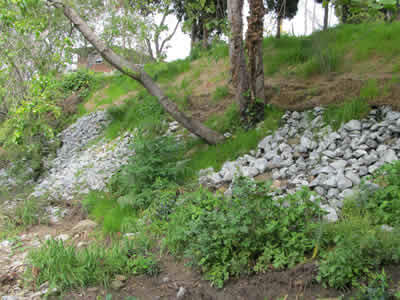 Specific components included enhancement to a floodplain scour feature to increase stream complexity and create additional alcove habitat for aquatic species, removal of a culvert and a portion of the historic levee, construct four instream large woody debris structures (LWD) to provide instream cover, improve sediment sorting, and encourage the formation of instream pool habitat, and selective levee breaching in five locations along lower Scott Creek to improve floodplain connectivity and facilitate a return to a natural flood cycle. 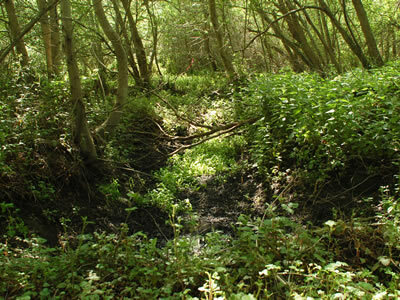 The second phase increased the amount of available off-channel/alcove, floodplain and instream habitat for winter refugia and summer rearing by grading four new connections between lower Scotts Creek and existing off-channel features, and constructing nine instream wood complexes. 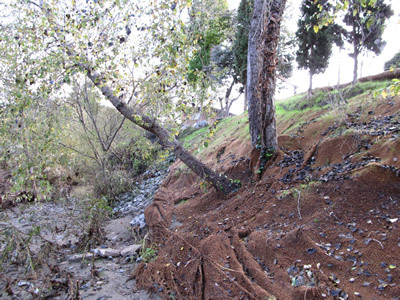 Following construction, 860 feet of existing road in the riparian corridor was decommissioned and re-vegetated to reduce floodplain velocities and decrease the potential for erosion during flood events. 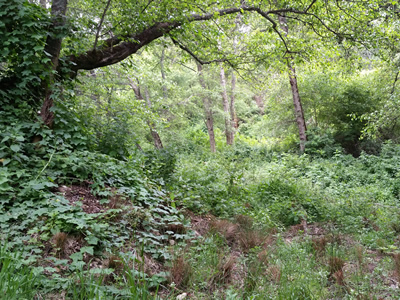 Photo Point 1: Scott Creek Habitat Enhancement. Natural plant recruitment of nativite species is flourishing. Structure continues to function properly. Photo Point 2: Scott Creek Habitat Enhancement. Structure continues to function properly. 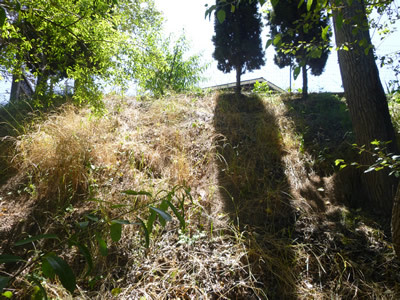 Revegetation effort was successful; however, significant land cover of non-native grasses has developed on berm. Photo Point 3: Scott Creek Habitat Enhancement. Structure continues to function properly. 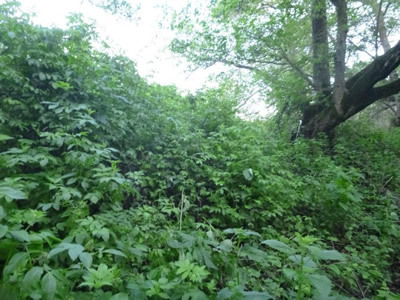 Revegetation effort was successful; however, significant land cover of non-native grasses and cape ivy has developed on and around the berm. 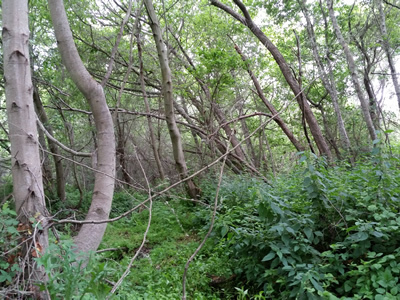 Photo Point 4: Scott Creek Habitat Enhancement. The complex LWD structure, on the top left, has modified the pool-riffle morphology. It has significantly enlarged th pool and extended and widened the assossiated riffle. It also created a point bar. Corralitos Creek and its tributaries support steelhead within the South-Central California Coast Distinct Population Segment. 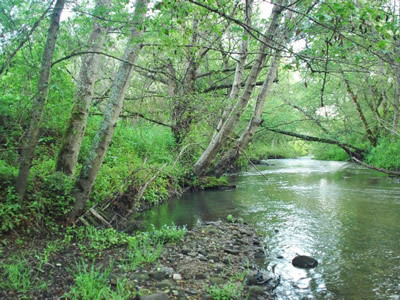 As the most downstream tributary to the Pajaro River, Corralitos Creek is the most accessible high quality habitat for steelhead habitat in most years. It is especially critical for steelhead in dry years, when passage higher in the Pajaro River system is impossible. A series of projects along Corralitos Creek have occurred to enhance fish passage along this critical corridor. 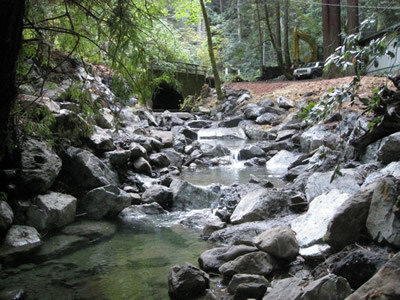 The County of Santa Cruz completed a fish passage evaluation at all County culvert stream crossings in 2004 and completed focused surveying in partnership with California Department of Fish and Wildlife. This process helped to identify key projects for IWRP review and prioritization. 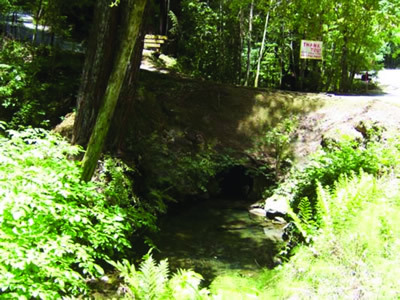 The County of Santa Cruz, City of Watsonville, the Koinonia Campground and the Resource Conservation District leveraged funding and technical support from the Integrated Watershed Restoration Program to implemented five fish passage projects in the Corralitos watershed, a tributary to the Pajaro Watershed, between 2008 and 2011. 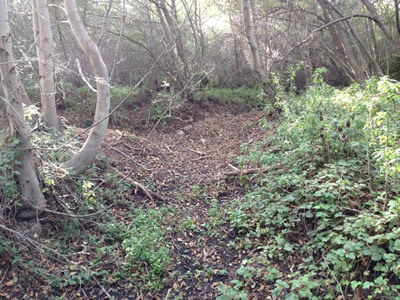 Together, these projects addressed all human structures that were considered barriers to fish passage in Corralitos and Shingle Mill Gulch creeks. In addition to being able to function as a trusted and neutral third party, the IWRP process contributed to the success of these projects through all phases of all five projects, including the early design review that enables agencies to help develop a project that can be permitted. In total, the Coastal Conservancy invested approximately $335,000 to design, permit and implementation of these 5 projects. This investment leveraged more than $2.7 million of implementation funding from a vast array of local, state, federal and private funding sources, about an 8:1 ratio. 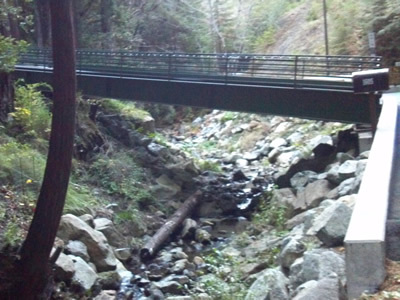 In the stream survey, Corralitos Creek at Eureka Canyon Road and Shingle Mill Gulch were considered the most severe barriers with the greatest extent of high quality habitat upstream. The IWRP TAC supported the development of fish passage projects at three sites in this priority area. 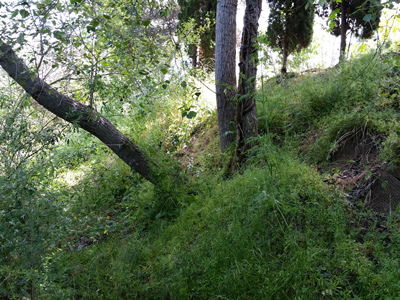 During the stream survey, the Koinonia Conference Center culvert was identified as a partial barrier but was not considered a priority project. 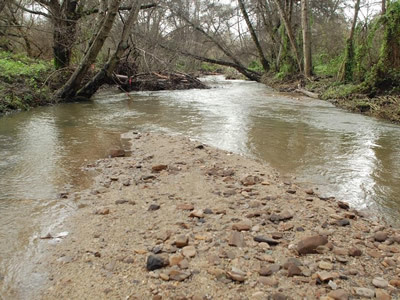 However, when Koinonia applied for a County permit to extend the culvert and increase the width of the road crossing, the Resource Conservation District of Santa Cruz was able to step in to develop a project to replace the culvert crossing with a bridge. Perhaps the most complicated and compelling of the fish passage stories in Corralitos is the City of Watsonville’s water intake and associated fish ladder at their Corralitos Creek diversion. The existing ladder was more than 30 years old, was in disrepair, and did not meet current fish passage criteria. As the most downstream passage barrier, IWRP partners were very interested in supporting the City of Watsonville in replacing the ladder. In order to meet current fish passage criteria, a juvenile ladder and an adult ladder were constructed side-by-side. Monitoring of juvenile salmonids indicate the fish ladder provides excellent passage, even during the past few drought years. Through IWRP trust-building, the City and Resource Agencies were able to enter into a collaborative process to design, permit and fund the new fish ladder and prioritize funding a new treatment plant to reduce summer diversion in favor or winter diversion. The ladder was completed five years ago and the City was awarded funds for the new filtration plant in 2014.